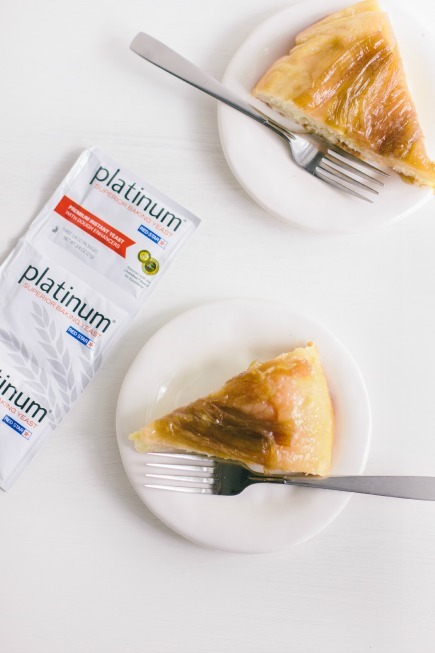 We test our recipes with the new Platinum product from Red Star with great results. 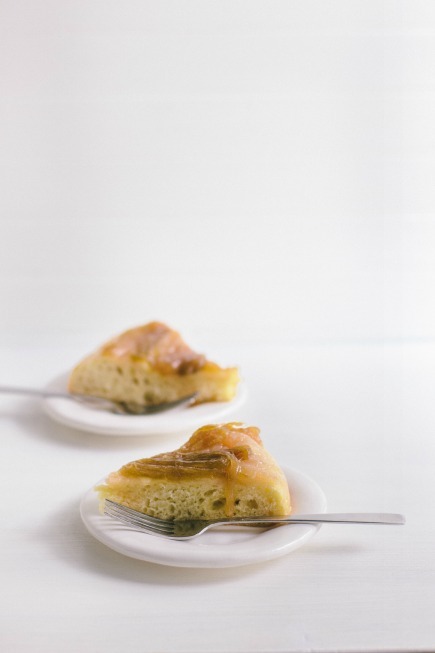 Size your rhubarb: If using longer pieces of rhubarb to cover the top of the cake, you may want to piece them to fit the pan (instead of using a specific weight measurement) as shown in the picture above. 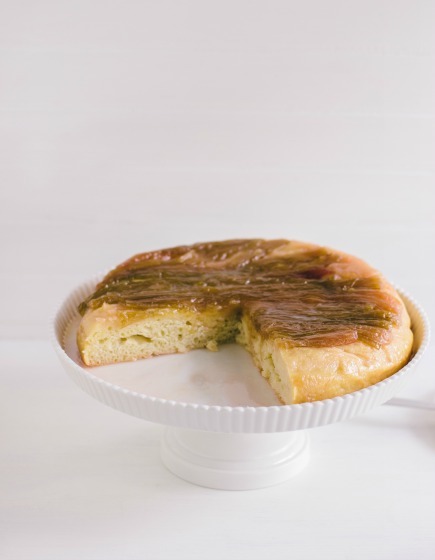 I used about 6 stalks of rhubarb for this cake. If you’d prefer to use small pieces scattered over the top, use a pound of rhubarb, and cut the stalks into 1-inch pieces. 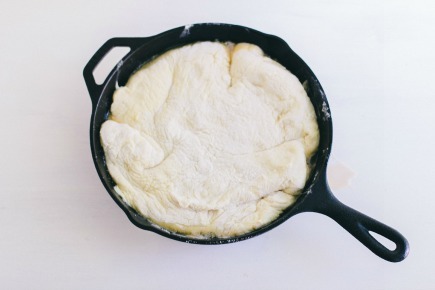 Melt the butter and sugar together in a 9-10 inch cast iron pan. Add the lemon juice, vanilla, and pinch of salt, and stir to combine. Carefully layer the rhubarb over the melted sugar mixture, and let cook until the rhubarb is tender, about 5-7 minutes. 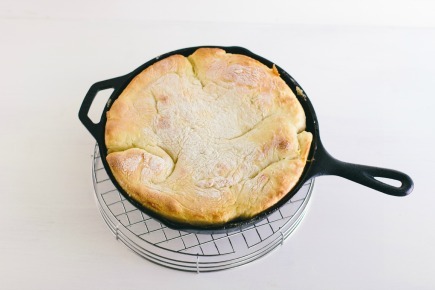 While the rhubarb is cooking, flatten the dough with your hands or a rolling pin, and roll out the brioche into a 9-10 inch circle (you want it to snuggly fit the pan you are using). 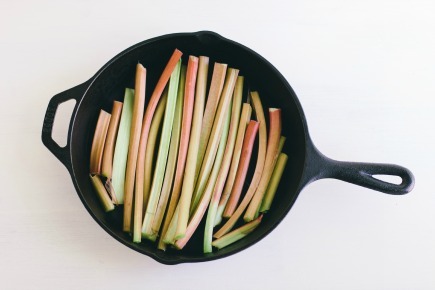 When the rhubarb is tender, very carefully (the pan is hot!) 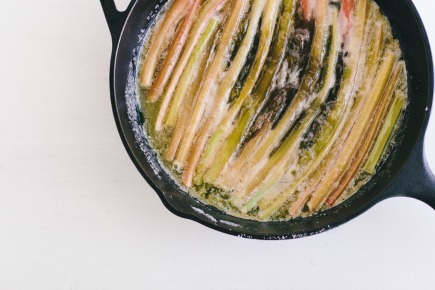 place the circle of brioche over the top of the cooked rhubarb. Make sure the dough is touching the sides of the pan. Place in the oven and cook for 25-35 minutes, until the brioche is golden brown. Move the pan to a wire rack, and let the cake sit for 10 minutes. After ten minutes, carefully flip the cake onto a serving platter. It does look perfect for afternoon snacking. I have a pot of rhubharb compote in the pantry that would be perfect for this. Thanks Sarah! Yum, yum, yum! We’re having a rhubarb bumper crop year this year in Nebraska so this will be on our table this week! Thank you for continually providing new recipes! Thank you for your reply to my request for help saving my brioche . Without your comments I might have pitched the dough. Although I did have to handle the dough more by incorporating the yeast after it still turned out a nice bread. I used it to make cinnamon swirl bread on day 4 and the brioche texture was good. Perhaps with enough sugar and cinnamon anything can be saved!! Lesson learned – careful when multitasking!! Yum thanks for the inspiration will definitely be tackling this recipe! I just made my first batch of brioche, and it came out amazing, but I was wondering if you have any advice for using sugar instead of honey, as I don’t always want that sweet honey flavor. I wasn’t sure how to adjust the recipe for changing a liquid to a solid. Also, just wanna say I love your book, it’s amazing. We just started using it about 2 weeks ago, and we’ve had fresh bread every day since, we’re in bread heaven thanks to you two. Kudos for running such a great website too! In most recipes, you can get away with a one-to-one swap by volume, but if I want to be persnickety, I consult Rose Levy Beranbaum’s “The Bread Bible,” where she notes that honey’s behaves as though it were 12.9% water in bread dough. So you’d slightly decrease the sugar and add a little more liquid. I think we’re just talking about a tablespoon or two. 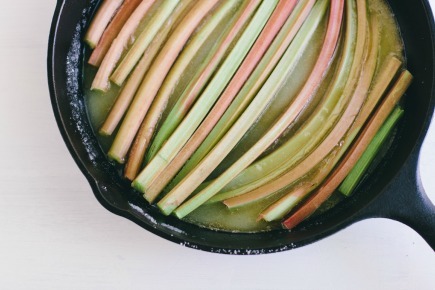 I was thinking about doing this with apples instead of rhubarb. Do you let the brioche dough rise at all in this recipe? It looks like you put it on the rhubarb (or apples) and then straight into the oven. You do not need to let the dough rise first. Which makes it nice and fast.